There's A Clown Shortage: Who Will Fill Those Big Shoes? : The Two-Way Coulrophobics may be happy. But fans of the red-nosed jesters have cause for concern. What if there's a call to send in the clowns and no one's there to answer? 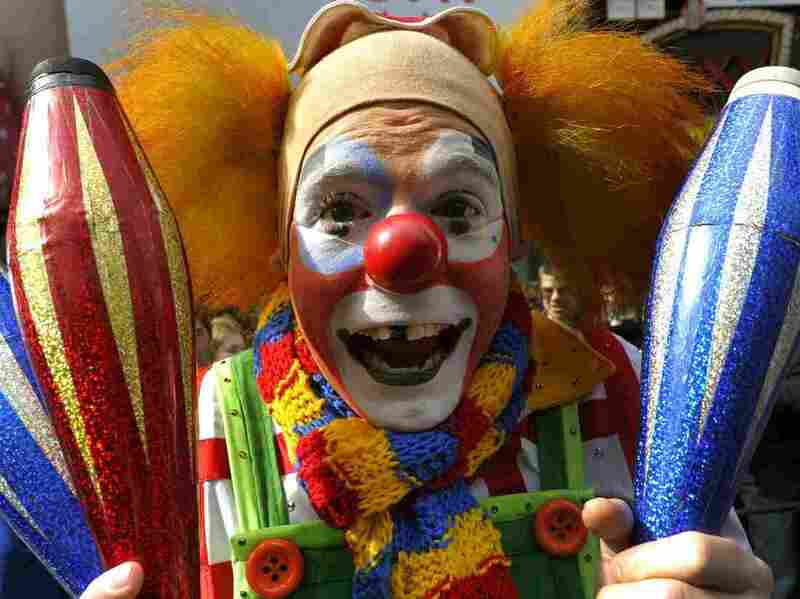 "Circus folk fear a national clown shortage is on the horizon," New York's Daily News reports. "Membership at the country's largest trade organizations for the jokesters has plunged over the past decade as declining interest, old age and higher standards among employers align against Krusty, Bozo and their crimson-nosed colleagues." " 'What's happening is attrition,' said Clowns of America International President Glen Kohlberger, who added that membership at the Florida-based organization has plummeted since 2006. 'The older clowns are passing away.' He said he wouldn't release specific numbers, citing the privacy of the members. "Membership at the World Clown Association, the country's largest trade group for clowns, has dropped from about 3,500 to 2,500 since 2004. 'The challenge is getting younger people involved in clowning,' said Association President Deanna (Dee Dee) Hartmier, who said most of her members are over 40." As Morning Edition's Renee Montagne said Tuesday, this is all "a pie in the face" for the clowns of the world. "Ringling Bros. isn't feeling the pinch. It said 531 people applied to attend its Ringling Bros. Clown College last year but only 14 were selected to take part in the two-week boot camp. Eleven of those were offered jobs with the circus." So it would seem there are still funny folks ready to pile into a tiny car when there's a call to send in the clowns. Before we go, we have a non-scientific question for everyone.